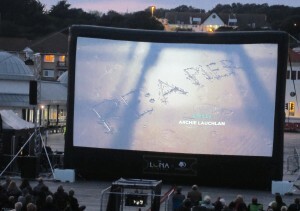 It’s the world premier of Archie Lauchlan’s feature documentary about Hastings Pier, AND the first ever outdoor cinema event on the pier! It’s a long awaited moment to see the pier Re: A Pier on the big screen and the people of Hastings really embraced this occasion to celebrate the triumph of their pier – returned to life after a £14.2m redevelopment to save the pier from dereliction and fire damage. Re: A Pier tells the story of the pier’s amazing journey from being on the verge of disappearing to the exciting 21st century structure it is today. RE: A PIER (trailer) from Domestic Science on Vimeo. Archie started filming the pier when he moved to Hastings in 2006 and by then it was about to be shut down as it had fallen into disrepair and from that point his film becomes the story of how the local community has rallied to save their pier. The town’s emotional attachment to the pier was tangible this evening as the audience recognized and felt with the ups and downs of the battle to save the pier. 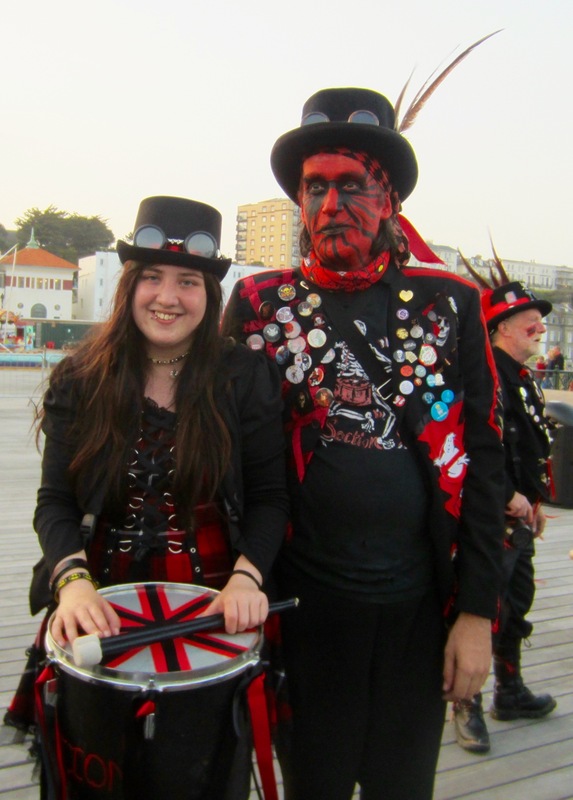 The people of Hastings really are the main character of the film; portrayed – in all their fun loving quirkiness and penchant for dressing up and parading the streets – with a lot of warm-heartedness. The film also gives a very valuable insight into the significance of the former pier ballroom as a musical venue and the superb interviews with both locals who have grown up on the pier as well as with musicians and key people from the music industry really paint a vivid picture of lived memories from the rock’n roll years all the way up to the 1990s when the pier was still playing a major role in seaside youth culture as an important venue on the emerging rave scene. 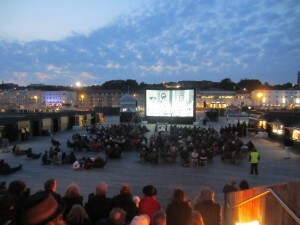 The open air cinema setting on the pier was perfect for the screening of the film; the town’s sea front as a backdrop to the film created an immersive feeling of being ‘in the film’ landscape, as did the soundscape of the sea and the nightlife – youth larking about on the beach punctuated by the sound of an emergency vehicle rushing by in the background. This impression was further underpinned by the wind catching the screen and the ripple animating in ‘3D’ the waves crashing on the shore as shot on film. With fish and chips at hand to enjoy and the appearance of the Section 5 Drummers, featured in the film, the atmosphere was similar to live cinema events such as Secret Cinema, combining film screenings with interactive performances in venues that echo the film setting to become part of the immersive experience. 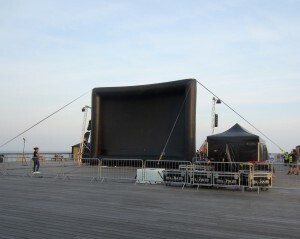 The pier has a lot of potential as an outdoor cinema venue. 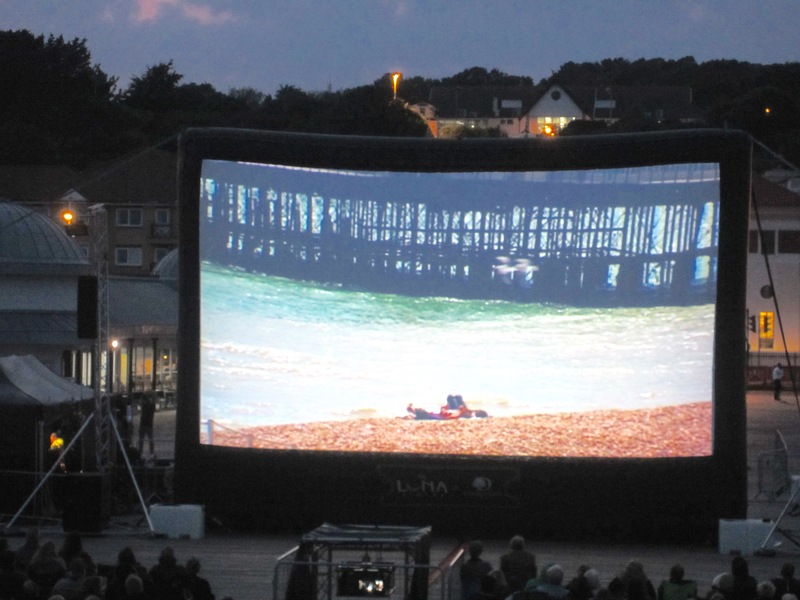 It has stunning views and the sunset as backdrop to the film, which is a sought after concept at the heart of other successful outdoor cinema events such as The Rooftop Cinema Club that runs in London and other major cities around the world. The emergence of event and immersive cinema was one of the main themes at the recent Live Cinema Conference at King’s College (27th May 2016) where film exhibition industry folks and academics discussed film screenings at site-specific locations, such as for example Secret Cinema or Backyard Cinema and other creatively enhanced cinema events often augmented through live performance or the use of costumes, props, food and drink. Innovative concepts like these are often seen as ‘niche’ in relation to mainstream movie watching, typically consumed in cinema complexes, and do risk to fall between chairs in terms of what appeals to the audience. In other words, are audiences mainly attracted by an exciting and unusual venue or by the film? 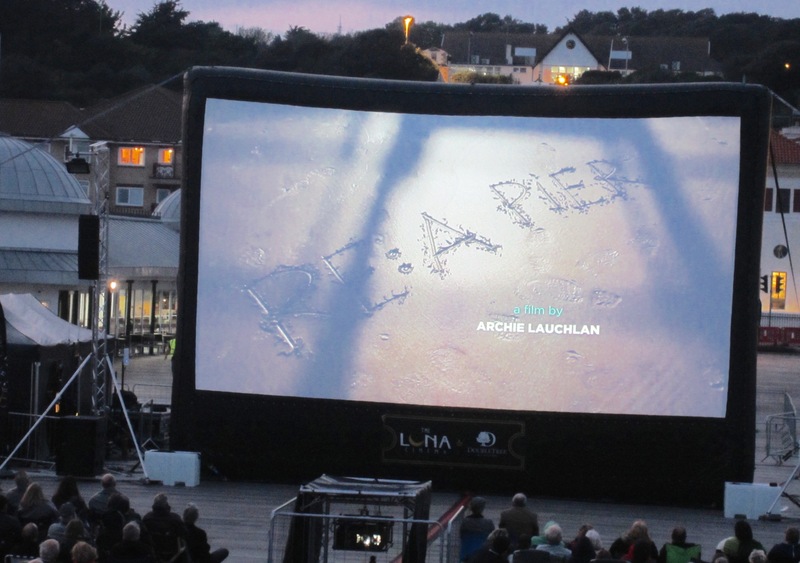 In the case of Hastings Pier there is without question a love for the venue – it is a selling point in itself so audiences come in part for the experience and in part for the film. Luna Cinema will continue open air screenings on Hastings Pier throughout the season with titles such as Star Wars, Dirty Dancing and Pride. 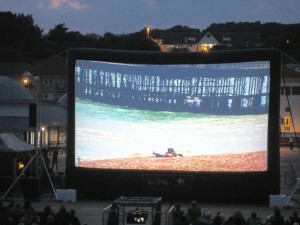 The People’s Pier research team are planning a pilot open air cinema event on Clevedon Pier in Somerset in August. Dr Olu Jenzen is Principal Lecturer in Media Studies at the University of Brighton. Her research ranges over different contemporary themes in media studies, and critical theory with a particular interest in the politics of aesthetic form. Her research also concerns popular culture as it intersects with debates of gender and sexualities; activism; marginalized communities; heritage; and digital and social media. Open Air Pop-up Cinema on Clevedon Pier ! © 2019 THE PEOPLE'S PIER. Theme by Anders Norén.